Morning Sylvie. I really like your card. Great wood background and the butterflies are fab. Hi Sylvie, its gorgeous love the design its perfect. sorry Its raining with you, sounds like we could do with a swap we need rain, haven't had any here for weeks, but we have wind, I have never known the wind to go on for so long, the sun is shining but it is just so chilly in the wind. How beautiful this is Sylvie! I love the bright butterflies against the subdued background. Another beauty Sylvie... it was cold watching cricket today! I think you still have the edge on us weather wise Sylvie! 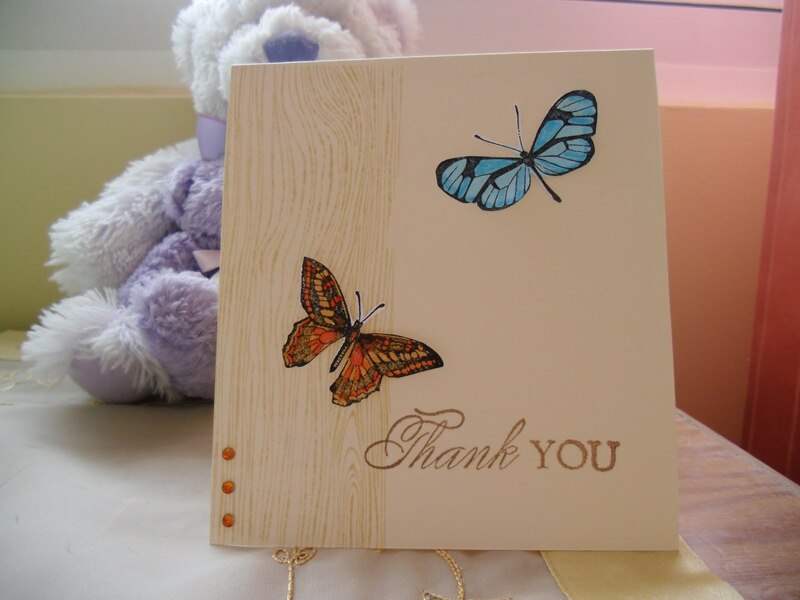 A really lovely card and think the lower butterfly blends so well against the wood grain, in fact I think that it would have looked even more stunning just on it's own. Only a thought. Sylvie, as I might have mentioned before...I do LOVE butterflies! A very pretty card! Love your gorgeous card,beautiful butterflies. What a pretty card-very eyecatching. I like the woodgrain effect down the side too.